First of all, I liked this book. I wasn’t sure that I was going to when I started it. First, Peter Stanford is a journalist and not an academic. The book is his first person account of how he got interested in the Pope Joan legend while staying in Rome and what he did to investigate it. The legend goes that a woman was able to con her way into being made pope and reigned for two years or so before giving birth during a papal procession. There are various versions of the story, either Joan and the child were immediately murdered by the mob, or only Joan was murdered and the child was allowed to live. For Edward Gibbon, Pope Joan was a code for the House of Theophylact and all its corruption. Stanford refutes this, however, citing that all theologians knew the stories of the house and openly recorded the transgressions without the use of any code. Nor is Pope Joan a fabrication of reformers trying to discredit and embarrass the Roman Catholic Church; information on Joan predates the Reformation. 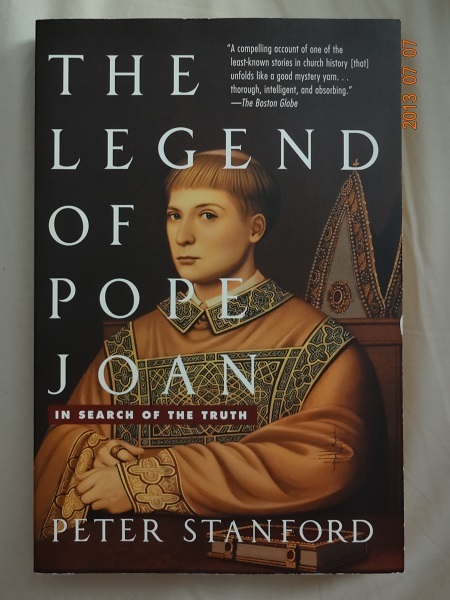 Stanford talks to those who had studied Pope Joan before him, but they shed no new light on the mystery. One interesting aspect of Stanford’s study is that he had a psychological profile created for a woman like Joan. Joan, the daughter of Christian missionaries from England, was born and raised in Germany and would have been educated there. Taking into account the times and the limitations put upon women, what would it take for a very intelligent woman to actually rise in the Church while hiding her sexuality? This part of the book is fascinating. But perhaps the most revealing part of the book has nothing to do with the Pope Joan legend, but with women who have already been ordained Roman Catholic priests. Stanford views them as modern-day Pope Joans. He interviews a woman in the Czech Republic who was ordained a Catholic priest during the communist era by Bishop Felix Davidek. Stanford discusses the so-called “Mexican faculties,” the name of which comes from the anti-clerical and anti-Church behavior during the Mexican Revolution. Because of immediate threats to the Church, the “Mexican faculties” allow priests to consecrate other priests and bishops to consecrate other bishops. This is how Bishop Jan Blaha ordained Davidek in 1968. The communist regime in Czechoslovakia was extremely repressive, and there was a fear that the Roman Catholic Church would be eradicated, which led to this extraordinary situation. It was Bishop Davidek who, in 1970, believed that by ordaining married men and women they would be less likely to be suspected by the government and could operate as clerics in secret without discovery. In the case of the woman Stanford interviewed, she was able to celebrate communion, hear confessions and perform other clerical duties for those Catholics imprisoned; no one in authority suspected a woman could be a priest. This seemingly validated Davidek’s initiative. Sadly, Davidek died in 1988, one year before Gorbachev’s perestroika began thawing East-West relations that resulted in the collapse of the communist regimes in Eastern Europe. Once Czechoslovakia was free, Rome refused to acknowledge Davidek’s ordination of women; the ordained men were told to join the Uniate church, those Eastern Christians who kept the Eastern Orthodox rites but acknowledged papal primacy; this church, like the Eastern Orthodox churches, have married priests. These men are betrayed, according to Stanford, since they have no connection to the Uniates but are Roman Catholics. At least they have an option in which to remain priests. The women have no recourse. Rome will not recognize the ordination of women under any circumstances. With Davidek already dead, he could not defend his actions. As older copies of Christian scriptures are found— predating the traditional holy writings by hundreds of years—we are discovering that pronouns were changed in many works from female to male, and that there are other Christian works where women are in leadership positions; there is evidence that women also performed clerical duties. Nonetheless, Rome—and the Eastern Orthodox churches for that matter—refuse to even consider the possibility of women priests. Was there a Pope Joan? There have been other books written about the possibility of a female pope. Many of these were written by academics. I have not read them, but I can say that I enjoyed this book. This is a very good introduction to the topic.